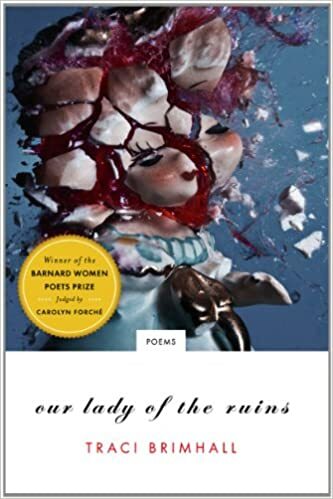 Our Lady of the Ruins, by Traci Brimhall, is a poetry collection that follows a group of women wandering through the apocalypse. The back cover describes the women’s journey as a "pilgrimage," which is a faith-based term if ever there was one, even though the women themselves are periodically, violently anti-religious. The collection is mythic and layered, the poems forming a fractured narrative. And it’s a challenging narrative at that: a text laden down with metaphor and imagination, taking its imagery from a number of sources and with journeys over land and sea, from the old worlds and into the new, even venturing down into the underworld. Steeped in the language of myth and pilgrimage as well as science, the first poem starts with an invitation that serves the same function as a question: "Imagine half the world ends and the other half continues" ("Music from a Burning Piano," p. 15). What apocalypse stories tend to share is a theme of faith: what it is to have it, what it is to lose it, and how the object of that faith is both constructed and reconstructed in a changing environment. The faith in question could be in family, or it could be religious, or it could be the inability of science to make it all better, to restore order and bring back a semblance of normal life. Faith isn’t the only post-apocalyptic theme, of course, but it is, I think, the preeminent one. Which is why it shouldn’t be constrained by structure. The individual poems in Our Lady of the Ruins are fragments of larger stories. They ask questions of a destroyed world, of the place of faith and the place of stories in a world where destruction and faithlessness is the new norm. Because of this, stories are strung through the text like little seeds, telling of how "curators removed an elephant’s heart / from the museum because it began beating when anyone / in love looked at it, how the coroner found minnows / swimming in a drowned girl’s lungs" ("Prelude to a Revolution," p. 16). Sometimes, though, these stories are twisted from what they once were. After visiting an oracle, the narrator records, "We tie new knots in her hair and swim / into the belly of a shark to retrieve the book / of signs" ("Come Trembling," p. 81). When it comes to oracles who are linked to the swallowing of great ocean creatures, we are more used to thinking of whales . . . but a shark is sharper, more deadly, and more apt for the gorging of war and end times. These twisted little references are found throughout the text, and explicitly so: later in the "Come Trembling" poem is the comment, "We want to believe, to split open the myth / and lie in it" (p. 81); but myths lose cohesion when split open, when examined for cold reality and superstition, and the skewing of the stories reflects a destabilized world in which the old beliefs have become insufficient. The spirituality that so conflicts the women at the centre of the collection is implicitly stated to be a form of Christianity—there are reliquaries and madonnas and cathedrals, although all of the last are burning, set alight by the pilgrims in an act of conscious destruction. "We tried to burn every cathedral in the country" ("Hysteria: A Requiem," p. 48) the narrator confides, but what is the purpose of such burnings? Are they vengeance upon a faith that proved to be inadequate, or are the fires set for the purpose of metaphor? It’s not a new image, fire in the service of purification, of transformation, but in times of struggle we often fall back upon the familiar. Often, but not always—and it’s in this land-mined area between old habits and the kicking against them that new myths are born. Mid-apocalypse is a time for doubt and darkness if ever there was one, and both take centre-stage in this narrative. Doubt is not only a reasonable condition here; it is a mandatory one. "You, chosen for your doubt, / remain on the bridge, caught in your quiet / passage from one broken country to another" ("Diaspora", p. 22). "You are the doubter and the doubt / worshipping a book you can’t read" ("Gnostic Fugue,", p. 35). Characters who don’t doubt, in an apocalypse, are not characters driven—or even influenced—by reason. Their faith tends towards fundamentalism, their one-track minds so broken by trauma, or by the opportunism granted by trauma, that they’re all too invested in faiths that don’t change. That can’t change, although that "can’t" is always a position both driven and enforced by a faith’s followers. It’s the people more attuned to the world around them, the people with the most awareness of the utter destabilization of apocalypse, that find their faiths both muted and mutating. The world of Our Lady of the Ruins has been scarred from war until it is almost unrecognisable. "The Colossus" states that, "In the beginning, none of us can tell rock / from bone" (p. 31). This is an example of the conflation of body and nature that is so often illustrated in eco-poetry, lifted out and inserted into another genre, one where the body is equally influenced by—and influencing of—the environment. Here the conflation between the two is underlined by the sterile landscape and the death of the narrator’s baby. Fertility and growth are beyond the personified natural, and the stories are instead those of death and burial, or death and cremation. The images of destruction in this collection are consistently linked with fire. New battlefields are "lit by strange flames" ("The Needful Animal," p. 32). Even the anonymous narrator links her own desire for obliteration with fire, following the death of her child in "Requiem for the Firstborn": "I can burn down the sugar cane" (p. 74). Some days she says that "fire is a mirror" ("Envoi," p. 78), comparing their different capacities for destruction. The only things the narrator can retain are "grief / and a new obedience and four pounds of ash" ("How to Find the Underworld", p. 75), where the ashes are remnants of fire and the only link to a destroyed past. In the collection’s introduction, Carolyn Forché links the apocalypse of the text with the holocaust that was the fire-bombing of Dresden in World War Two. Forché describes Brimhall as "standing, as the stone lady stood in the ruins of bombed Dresden (as it happens, near the Church of Our Lady), keeping vigil in the aftermath." The holocaust at Dresden is an apocalyptic landscape also caused by science: the white phosphorous bombs causing fires that would foreshadow the coming atomic bomb. Brimhall, by exploring the lives of the survivors of her own scientific apocalypse, tells their stories by metaphors and mixing, echoing science with myth to make new stories and new meanings for the new (and frequently hideous) world. This merging of myth and science is repeatedly illustrated in the text. I’m thinking of one particular image of a fossil, standing as proxy for the subjective nature of personal truth. The narrator tells of her sister, who knows "that a fossil leaves two stories—one about unmiraculous fish and loaves and a hill crowded with atheists muttering mass, and one about carbon" ("The Revisionist Gospel," p. 36). Or there’s the poem in which the women visit monks in "The Orchard of Infinite Pears" (p. 82)—monks who refuse to speak, whose primary interest now seems to be in the mathematical properties of zero. If they’re spreading any word at all now, any gospel, it’s of fruit and arithmetic instead of divinity.